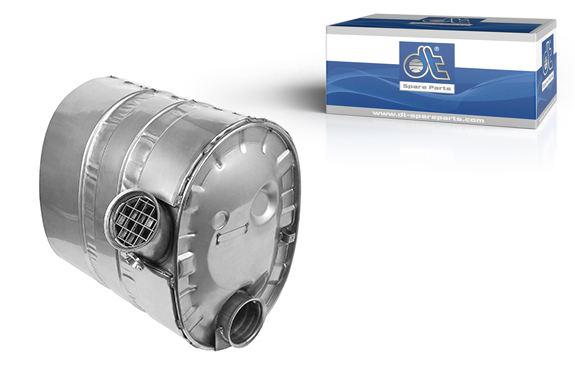 Due to its integrated catalytic converter, the Euro 4/5 silencer provides a drastic reduction of pollutant and noise emissions, as well as a reduction of fuel consumption. The silencer 6.37026 is characterized by its high heat resistance and durability, as well as a high-quality finish. The housing of the silencer is made entirely of stainless steel. The perfect fit ensures easy installation without additional modifications to the vehicle. The built-in catalytic converter is made of ceramic and is equipped with a special coating, leading to a reduction in pollutant emissions. Before renewing the silencer, all mounting and fastening elements should be checked, in order to avoid a delay in the repair. With the help of a lifting device, the old silencer can easily be dismantled and the new one optimally aligned to the old mountings. A zinc paste facilitates the installation of the attachment parts. The correct torque should be observed to avoid material deformation. After renewal, a leak test should be performed on the exhaust System. The dismantled element is to be disposed of in an environmentally compatible manner.